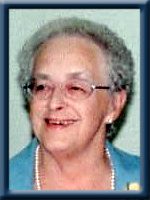 RICHARDS – Ella Maude, 83, of Queens Manor, Liverpool, formerly of Brooklyn, passed away peacefully on Tuesday, April 30th, 2013 in Queens Manor. Born in Bear Point, Shelburne County, she was a daughter of the late H. Leland and Dora (Perry) Smith. Ella taught school for a few years before deciding to enroll in the Victoria General Hospital School of Nursing program. Following her graduation in 1952, Ella worked as a registered nurse until her retirement. She was a member of the Liverpool United Baptist Church and the Ladies Auxiliary as well as the Womens Missionary Society and the WWT. She was an active member of the Queens General Hospital Auxiliary and the Hospital Hustle. She enjoyed bowling, traveling and especially loved to spend time with her family and friends. She is survived by her husband of 58 years Erwin, her daughter Elizabeth (Mark) Bamford of Dartmouth, her son Stephen (Sue Taylor) of Elmsdale, her grandchildren Tracey, Evan and Sean, her twin sister Ethel (Sinclaire) Richards of Bridgewater and her brother Morton (Marion) Williams of Liverpool. She was predeceased by her infant son David and stepmother Edith Marie (Douglas) Smith. Visitation will be Thursday, May 2nd, 2013 from 7 until 9 p.m. and funeral service will be Friday, May 3rd, 2013 at 11:00 a.m., both in Chandlers’ Funeral Chapel, Liverpool. Reverend Steven Hopper officiating. Burial will be in Liverpool United Baptist Cemetery, Liverpool. Family flowers only, donations may be made to the Liverpool United Baptist Church. Online condolences may be made to www.chandlersfuneral.com. Morton: We were sorry to hear about Ella. Our thoughts and our prayers are with your family. Please accept my sincere sympathy on Ella’s passing. As you know I worked for a long time in association with her. To Ella’s Family: We are so sorry to hear of Ella’s passing. Our sincere sympathy to her family. Morton and family. We are sorry to hear of your sad news. Our deepest sympathy to the family. So sorry to hear of Ella’s passing. I bowled with Ella several years ago and then my husband and I spent time at Transcotia when Ella & Erwin had meals there as well. Our condolences to Erwin and family. Our deepest sympathies in your time of loss. So sorry to hear of Ella’s passing she was well liked our thoughts are with you at this difficult time. So sorry to hear of Ella’s passing. You are certainly having your share of grief these last two weeks. Our thoughts and prayers are with you. Our condolences to Ella’s family. Morton and family members, We are sorry to hear of Ellas passing. May God send his healing comfort to you all..
please accept our sincere sympathy on Ella’s passing . My sincere sympathy to all of Ella’s family. I bowled with Ella for many years. It was always a pleasure to see her and Erwin when I was visiting Liverpool. She was a great lady and will be sadly missed! So saddened to read in the Chronicle Herald of Ella’s passing. My mother Doris Halliday Goulden always spoke so fondly of her. My sincere sympathy to Erwin, Elizabeth, Stephen, Ethel and Families. She certainly lived a good life and a very valued member of the community. Sorry to hear of your loss. Deepest sympathy. We are very sorry to hear about the loss of your mother. please accept our heartfelt condolences. Our love and prayers are with you. Erwin and family.. Angels be with you all…Please except my condolences on Ella’s passing, Enjoyed her completely in my short term of employment, May you find strength in each other at this sad time.. So sorry to hear of your mother’s passing. Please know that you are in our thoughts, and take care of one another. Please pass on my condolences to your father. Erwin, Liz and Stephen ; Sorry to hear of your loss. Our thoughts are with you. Liz, so very sorry to hear about the passing of your mom. So sorry to hear this. Please accept our sincere sympathy to all of Ella’s family. So sorry to hear of Ella’s passing. Our thoughts are with you. Liz , So sorry to hear about your mom’s passing. Thinking of you at this difficult time. To all of Ella,s Family,We are very sorry to hear of her passing,Our thoughts and prayers are with you all at this sad time. Please accept my most sincere condolences on your loss. I hope that your memories and the passage of time will provide healing. We are saddened to hear of your loss. Our thoughts are with you at this difficult time. Sorry to hear of the loss of your mother, my prayers are with you. So sorry to hear of Ella’s passing. Cherish the wonderful memories that you have of her and they will help you get you through the difficult days ahead. Our thoughts and prayers are with you at this most difficult time. So sorry to hear of Ella’s passing. Cherish the wonderful memories that you have of her and hopefully they will help you through the difficult days ahead. Our thoughts and prayers are with you at this most difficult time. We would like to send our sincere sympathy to all at this difficult time. My sincere condolences to Ella’s family. God Bless You All. Sorry to hear of your loss, my thoughts are with you at this difficult time. No words,however kindly meant,can take your pain away,but I hope the love around you will help you through today.I hope each day that passes brings you comfort . Ella and I had a great many laughs,mostly her laughing at me. Thinking of you at this very difficult time. Keep her memories close to your heart as she will always be with you. Very sorry to hear of Ella’s passing. Our thoughts are with you at this difficult time. Sorry to hear of Ella’s passing. I have often thought of you Ethel and Morton, wondered where you were living. I have many great memories of our time together in Bear Point, at school, at the Baptist Church and the evenings we would meet together at your home to play a few games. I remember when you and Ella were in training at the VG Hospital. I was on staff there at that time. My thoughts and prayers are with you. May God bless and strengthen you at this sad time. So sorry to hear of Ella’s passing. Our thoughts and prayers are with you at this difficult time. I well remember, years ago when you and Ella visited us in the ‘Village’…they were pleasant memories..Our condolences go to you and family and of course to Ella’s Twin, Ethel. God bless. I am so sorry to hear of Ella’s passing. Hold onto the many memories that you have as they will guide you through the difficult times. I remember the love and devotion that Ella always gave to you and her family while we were growing up. We have been very blessed to have had the guidance, encouragement and support that our parents have always given us. I fondly remember, when we were younger, getting permission for the fun sleepovers in the playhouse and later, as teenagers, the curfews. There are many miles between us in, but my thoughts, prayers and heart are right there with you now. So sorry to hear of your Mother’s passing; such a difficult time for you and your family. Take comfort in knowing she is at peace and that you have a large circle of friends who care about you.